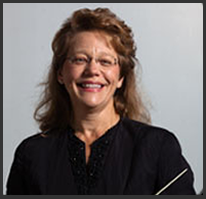 Ruth H. Erbe is an active music performer, conductor and educator in the Northern Virginia area. She studied violin with some of the finest instructors in the area, including Vernon Summers and Luis Haza of the National Symphony Orchestra and Herbert Greenberg of the Baltimore and Pittsburgh Symphony Orchestras. Ms. Erbe’s conducting credits include studies with Robert Page, Keith Lockhart and Anthony Maiello. She pursues an active freelance career and is a member of the Maryland Symphony Orchestra (MSO) in Hagerstown, Md. With the MSO, Ms. Erbe performed for many years under the baton of famed French horn instrumentalist and conductor Barry Tuckwell and currently for Elizabeth Schulze. She has performed concerts with the Richmond and Fairfax Symphony Orchestras, as well as for many chamber ensembles and orchestras formed specifically for concerts, church services, weddings and other occasions. Ms. Erbe has spent her entire career as a music educator. She maintains a home music studio where she teaches private violin and viola lessons. Many of her young students have found success in their school orchestras and beyond. Her adult students enjoy improving their skills and working with challenging and inspiring music. In 2008, Ms. Erbe was appointed as the first music director and conductor of the Washington Metropolitan Concert Orchestra (WMCO), a full orchestra, for youth performing at an intermediate - advance level. WMCO offers students the opportunity to play in an accomplished orchestra while developing their music skills and serves as a developmental orchestra for the Washington Metropolitan Youth Orchestra (WMYO). As a young musician growing up in the Northern Virginia area, Ms. Erbe performed in the Mount Vernon Junior Chamber Orchestra, the precursor of the WMYO. Ms. Erbe is also music director and conductor of, The Annandale Strings. Founded in 2007 and based at Hope Lutheran Church, in Annandale Virginia, The Annandale Strings is an amateur, adult chamber orchestra, dedicated to the study and performance of great string literature. The Annandale Strings performs throughout the Northern Virginia community.